Author Doug Goudie will discuss his latest book, A Frost In Hell: The True Story of the Petersham Butcher of 1875. On July 4th, 1875, while most people were planning celebrations, Samuel J. Frost was committing an outrageous murder. He would become a national sensation, but not so much because of his crime. Instead, it was his fascinating trial that captured attention. It contained a first-of-its-kind appeal, and resulted in a last-of-its-kind punishment. Goudie tells the story of a nondescript farmer from a 'never-heard-of-it' town who captivated Massachusetts for all of the wrong reasons. 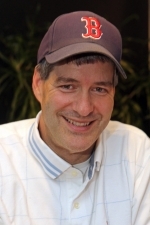 More about the author: Doug "VB" Goudie has spent much of his career in talk radio in Boston, and is a former Fox 25 news personality. In addition to A Frost in Hell, he published an earlier book titled Ack in Ashes: Nantucket's Great Fire of 1846. Capacity: 85 of 100 spaces available.